Last fall I went to Greece and enjoyed amazing food and beautiful scenery (not to mention the company of my favorite people!) So when the nice people at Stonyfield asked if I'd like to try some Greek yogurt, I knew everyone at my house would be happy. My brother says the Greeks use yogurt like crazy and even serve it with beans (he didn't want me to recreate that one, though). We tried several different recipes, subbing in the thick, strained yogurt for sour cream and to add richness to other dishes. Seriously, people didn't believe that it was fat free. And good for you (and you don't even have to go to Greece to get some? Though I'd still recommend the trip...) This cinnamon dip is sweet and tangy and perfectly compliments all the fresh fruit overflowing right now. And since it comes together in one bowl in as many minutes, it'll make everyone happy. Combine the yogurt and honey in a small bowl. Mix thoroughly until smooth and well combined. Add a very small amount of cinnamon, taste, and adjust accordingly. Cover and refrigerate. Serve with fresh fruit. Yum! I got some of that yogurt, too. Wish I could find the big containers here! I love it when a "treat" is healthy! 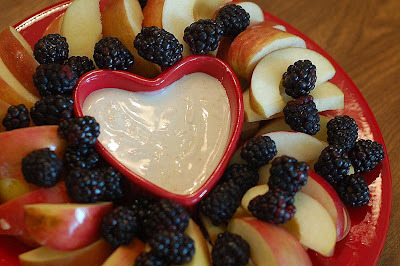 I love fruit dip - so perfect for summer entertaining! Sounds like such a refreshing summery dip. Also, I love cinnamon and berries (or fruit in general). Yum! I'm so glad I live only a short plane journey from Greece. You can't beat it - have to get my fix at least once a year. I absolutely love yogurt and this one is a must try!! Such a simple, exquisite snack/dessert/breakfast...you name it- any time. And so pretty. My great grand father is from Greece and he is crazy about yogurt. Here in Chile, we can't find greek yogurt, but there's a brand that makes a really thick, rich yogurt wich my grandfather says is like the greek one.